These girly gadgets are petite enough to fit in the pocket of her purse, but tough enough to hold that horrifyingly heavy thing above a restaurant floor. 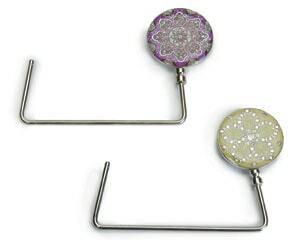 She simply flips the bejeweled disk so it rests on the table, then hangs her purse handle from its hook. $14, Oliver’s Trendz, Gaylord, 989-732-2115; Petoskey, 231-487-0673; Mackinaw City, 231-436-5752.